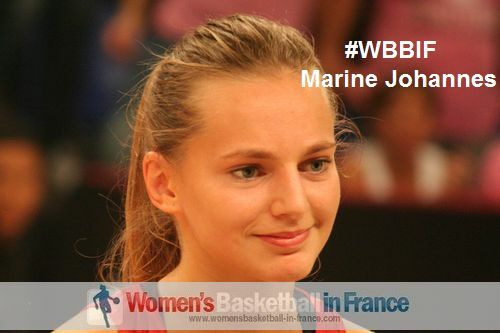 This women's basketball blog provides you with news and information on the world of women's basketball in France and abroad and about youth players. Nonetheless you also find all the latest updates on the site. While COB Calais and Hainaut Basket are fighting against relegation with Calais winning their third match this season in round 23 against Charleville-Mézières, Hainaut Basket take the victory in round 24 against Arras for their second win. Closing up to the top 4, Bourges Basket, Lattes Montpellier, Villeneuve d'Ascq, Basket Landes, ... are Angers despite losing last weekend. They are followed closely by Tarbes in 6th position. Nantes-Rezé have lost out momentarily to USO Mondeville for a possible play-off spot and drop to 9th place while Toulouse, Charleville and Lyon follow in 10th, 11th and 12th position respectively. Continue reading "LFB round 21: March madness starts with a bang"
Continue reading "LFB round 20: Good performances and absent friends"
Continue reading "LFB round 19: Welcome back Miss Go as play-off picture takes shape"
Continue reading "LFB round 18: Stats do not lie"
In the LFB round 17, the bottom 3 still do not win while five in the top 6 win again./Les lanternes rouges sont dans les rouges pendant que cinq des six premiers du tableau gagnent. Continue reading "LFB round 17 with Angers confirming"
January was a good month for the top three teams in the LFB while Arras, Basket Landes and Angers follow closely./Le top 3 s'écarte du reste des formations. Continue reading "LFB January round-up: Winners and losers"
The LFB round 14 was overshadowed by death./Quand la France souffre, la LFB aussi. Continue reading "LFB 2014-2015 Round 14 overshadowed by terror events"
2015 starts well for COB Calais with their first victory in the LFB this season ./ La lanterne rouge, le COB Calais remporte sa 1re victoire dans cette saison. Continue reading "LFB round 13 - A happy new year for COB Calais"
The first half of the 2014-2015 LFB season is almost over and Tango Bourges Basket are alone at the top. / Ce sont les Tangos qui se maintiennent seules en haut du tableau à la fin d'année. Continue reading "LFB 2014-2015: Tango Bourges Basket alone at top as teams break for Christmas"
Tango Bourges Basket beat Basket Landes and go top while Sarah Michel shines on LFB-TV./Les Tangos sont au sommet pendant que Sarah Michel fait le show. Continue reading "LFB Round 11: Tango Bourges Basket, the new leaders"
Continue reading "LFB 2014-2015 winners and losers from round 10"
Continue reading "LFB round 9 - Beauty of double-doubles are the order of the day"
Social media has become the driving force for basketball news, so wbbif is changing its basketball coverage of basketball in France. 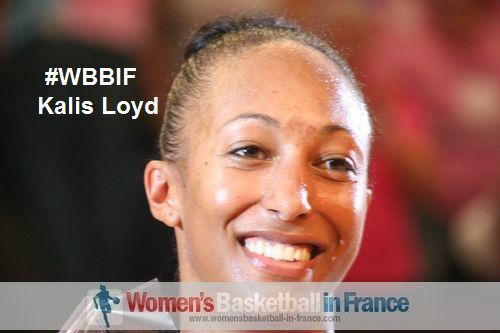 Continue reading "Basketball news: Articles from the world of women's basketball in France"
Continue reading "Pink is the LFB colour of the week"
Continue reading "LFB round 7: Saturday rules do not apply on Sunday"
When the assists are high, you win most of the time in the LFB. / A part Calais, toutes les équipes qui font plus de passes décisives, gagnent. Continue reading "LFB: Kathy Wambe would have enjoyed last weekend"
A high scoring week in the LFB leaves no teams undefeated after just five rounds of games./Après la 5e journée en LFB, il ne reste pas une seule équipe invaincues. 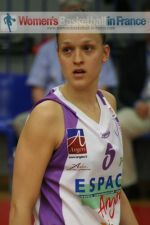 Continue reading "Some climb the LFB ladder while Tango and Montpellier come to a halt"
Continue reading "Basketball news: A week to forget for Hainaut Basket"
The main basketball news for round 2 of the LFB was the season ending injury to Matea Vrdoljak from Arras./Arras perd son match et son capitaine! Continue reading "Basketball news: Not the start Villeneuve d'Ascq wanted for new season"
Playing basketball on day 2 of the Open LFB is more physical with Basket Landes, Charleville Mézières & Nantes Rezé winning./2e journée de la 10e Open LFB: COB Calais en difficulté. Continue reading "Playing basketball on day 2 of the Open LFB is much more physical"
Continue reading "When playing basketball at the Open LFB, Tango Bourges Basket always wins"
Marine Johannes propelled USO Mondeville to victory over Lyon (78-70) with an impressive third quarter burst. 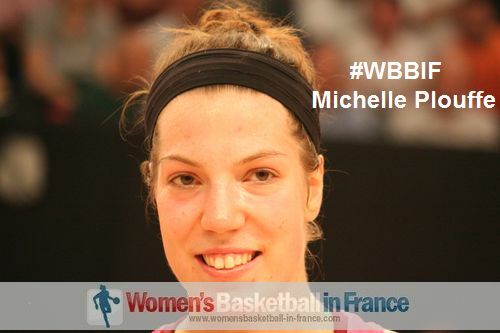 Post by womensbasketball-in-france.com - Playing basketball in France. Miquel Bordoy Cano's last day blog entry about the U17 World Championship for Women is not flattering with a lot of harsh words. Continue reading "Criticism of World Championship in Miquel Bordoy Cano's last blog entry"
USA three-peat in retaining FIBA U17 World Championship for Women title, France finish 8th./3e fois d'or pour les USA, Espagne en argent, Hongrie en bronze, France 8e! Continue reading "FIBA U17 World Championship for Women winners are the USA again"
Miguel Bordoy Cano's blog of the the World Championship's sixth day is about strategies for Spain to beat the USA. Continue reading "World Championship final thoughts for Spain by Miquel Bordoy Cano in his blog"
USA and Spain will fight for the 2014 FIBA U17 World Championship title while France play for 7th place./L'Espagne et les USA se battront pour l'or, la France se contentera d'une éventuelle 7e place. Continue reading "U17 World Championship finalists are Spain and the USA"
One on one: USA basketball U17 coach Sue Phillips at the 2014 FIBA U17 World Championship for Women talks to wbbif. Continue reading "World Championship U17 Women - One on one with Sue Phillips"
Miguel Bordoy Cano's blog about the World Championship's fifth day is about all the emotions and disappointment for the winning and losing teams. 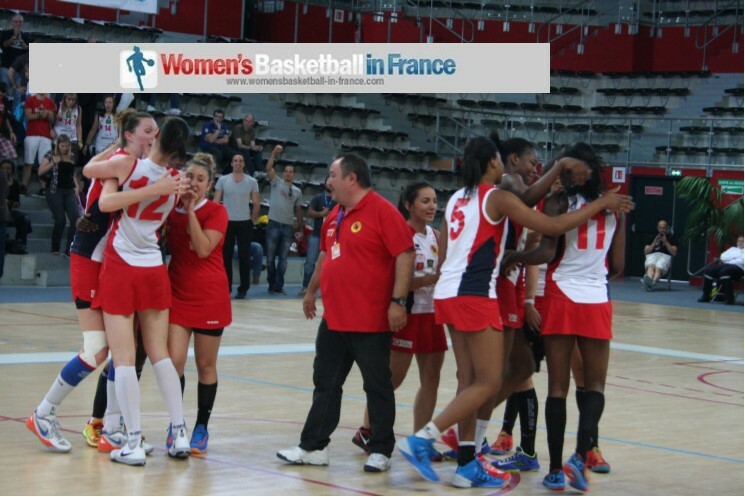 Continue reading "World Championship can be very emotional, says Miquel Bordoy Cano in his blog"
France were eliminated by Spain in the quarter-final of the 2014 FIBA U17 World Championship for Women./Ce n'est pas la France qui sera au semi-finale du Championnat de monde de basket fémin U 17. Continue reading "U17 World Championship semi-final without France"
Despite qualifying in the U17 World Championship for the quarter finals, Miquel Bordoy Cano feels that the qualified teams should feel a little happy about their success. Continue reading "World Championship wins should be joyful, says Miquel Bordoy Cano in his blog"
The World Championship quarter-final is set after a dramtic day of action. / Les équipes de la quart de la finale après la phase de 16 connaissent leurs adversaires. Continue reading "2014 U17 World Championship - No shocks in the round of 16"
The blog about the third day of the FIBA U17 World Championship by Miquel Bordoy Cano is seeing more commitment by the teams. Continue reading "World Championship blog of day 3: Miquel Bordoy Cano awaits more "
After three days of basketball at the 2014 FIBA U17 World Championship for Women, the brackets are set as the competition moves to the elimination stage./La 1e phase du mondial U 17 s'achève. Continue reading "U17 World Championship for Women brackets set"
Find out about the thoughts of the 2nd day of the 2014 FIBA World Championship for Women from Miquel Bordoy Cano's view. Continue reading "World Championship for Women day 2 thoughts: Breather"
Continue reading "FIBA U17 World Championship drama in Klatovy and Pilsen"
wbbif presents the daily thoughts of the FIBA U17 World Championship for Women by Miquel Bordoy Cano. Continue reading "FIBA U17 World Championship for Women - Disappointment on opening day"
Continue reading "FIBA U17 2014 World Championship Women is off and running "
Continue reading "FIBA U17 World Championship for Women 2014"
The LF2 Final Four final winner is Perpignan Basket 66 after beating COB Calais (76-56)./COB Calais échoue dans sa quête de gagner la finale de la final four contre Perpignan Basket (56-76). Continue reading "LF2 Final Four final winner is Perpignan Basket 66"
In the LF2 Final Four bronze medal match, Pau Lacq Orthez repeated its exploit from last year, beating Roche Vendée ./Pau Lacq Orthez gagne pour la 2e année consécutive bronze dans le Final 4. Continue reading "The LF2 Final Four bronze medal returns to Pau Lacq Orthez"
COB Calais avenge 2013 LF2 final defeat against Pau Lacq-Orthez (69-66). / COB Calais a le dernier mot dans le 2e match de la Finale Four et le remporte contre Pau Lacq Orthez. Continue reading "2014 LF2 final four hosts Calais make it to final"
Perpignan Basket qualify for their second LF2 championship game after edging out Roche Vendée (55-53). / Perpignan réussit d'emporter de peu la demi-finale de la Final Four sur Roche Vendée. Continue reading "2014 LF2 Final Four: Perpignan Basket 66 in the final again"
Bourges Basket win the Coupe de France Joë Jaunay for the 9th time by beating Villeneuve d'Acsq (57-48)./Villeneuve échoue contre Bourges Basket dans leur quête de gagner la Coupe de France. 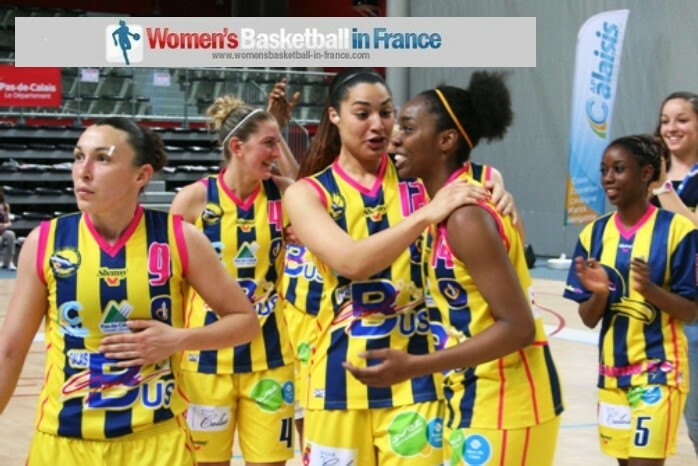 Continue reading "2014 Coupe de France goes to Tango Bourges Basket"
CSP Rezé win the 2014 edition of the trophée féminin Coupe de France by beating Geispolsheim (71-53). / Une deuxième visite à Paris leur rapporte le trophée féminin: CSP Rezé. Continue reading "Trophée féminin Coupe de France 2014 winners are CSP Rezé"